Tuesday, March 14, 2017 Filed Under: Film | Why Did I Watch That? It is hard to call a children’s movie bad in the same way that I do with a lot of the films that I watch or this series. I hold children’s movies to a different standards. I don’t expect depth of plot or complex characters or action. But no matter what, I don’t expect a movie like this. Leo the Lion confused me, left me scratching my head at many of the decisions that were made. It is part rip-off of The Lion King, part argument for vegetarianism. 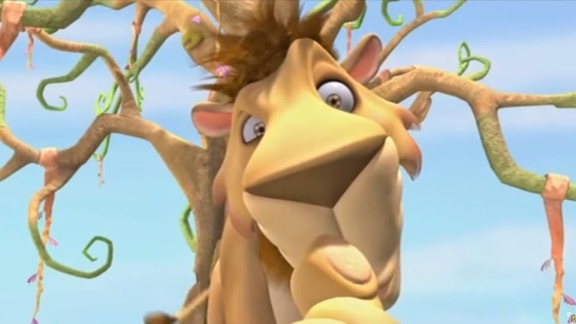 It is about Leo, a vegetarian lion that watches his mother die in the first five minutes of the movie, a scrawny and awkward lion that is put in charge of two baby elephants that call him daddy as he tries to guide them to the heart of the jungle. There are weird songs, an old gazelle with dentures, monkeys with rats hats, and none of it is ever explained. There are humans chasing them around in helicopters, shooting them with tranquilizer rifles to kidnap them for zoos. The villain is an evil elephant who has a song where he stands on a cliff, overlooking a crowd of evil elephant stormtroopers marching in lockstep beneath him. He’s an elephantine Hitler, and at one point he says to two baby elephants that he will crush them like grapes and kill their mother and leave them as orphans. The movie ends with a four minute song reminding you over and over that Leo is a vegetarian. You see, the heart of the jungle was inside him all along and for saving her children, the mother elephant falls in love with him and they have weird elephant/lion hybrid babies that could best be described as “horrifying”. This movie is not good, It’s strange, and bad, and poorly animated, but it leaves you almost in shock as you try to find out what the hell you just saw.